Inter coach Luciano Spalletti insists his side's upturn in fortunes has nothing to do with the continued absence of striker Mauro Icardi. The Nerazzurri cruised past Rapid Vienna 4-0 on Thursday to seal a 5-0 aggregate win and book their place in the last 16 of the Europa League – their fourth consecutive win after a four-game winless run. The latest win came without Icardi, who has now missed Inter's last three games amid speculation he could leave the club after being stripped of the captaincy. Far from believing their improvement is down to a better team spirit caused by Icardi's absence, Spalletti attributes it to something more simple – hard work. "It is correct to say that Inter are improving and making fewer errors than before, but it is not fair to allude to something else that happened during this period," he told Sky Sport Italia. "Let's view it from the right angle here, which is that the team is working hard and making fewer mistakes. 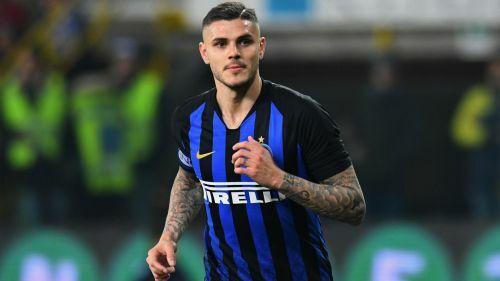 "Let's not talk all the time about this [Icardi]. Let's focus on the players who were out there today, playing, running, getting kicked and not losing sight of the reality of the situation. "We are trying to reach this level as our normality, without the ups and downs. We need to get that sorted as soon as possible, because again last season we did well only for spells." Goalkeeper Samir Handanovic has taken over the captain's armband from Icardi, but the Slovene insists any number of senior players could lead the team. "The armband is not a title of nobility or a trophy," he said. "It is a great responsibility and at Inter an honour. We don't need just one person wearing the armband, because we need five or six leaders who push the squad forward. It doesn't matter who wears the armband."